Tip! Click on the smaller images to open a new window with an enlarged view! Coffee in India is not as widespread as tea, but its cultivation has a much longer tradition: it was brought as early as the 17th century from Arabia to the South Indian state of Karnataka by Baba Budan, a Mecca pilgrim! Thus, as a general rule, today you get good filter coffee in South India and tea in the North. Indian coffee is known for its fine aroma, because, in comparison to other coffee-growing countries, it grows more in the shade and less under direct sunlight. 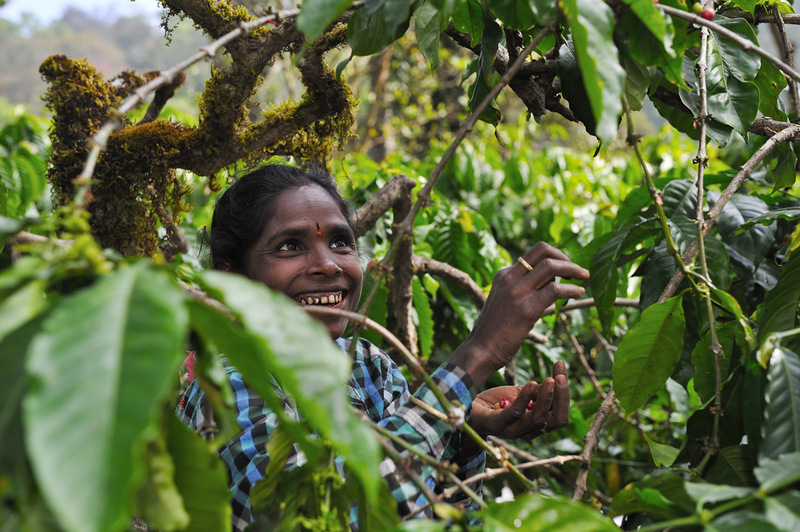 Over 90 percent of the Indian coffee-growers are small farmers – there should be roughly about 250,000 of them. For this reason, I looked in particular for a small farmer to get the most typical possible impression of coffee cultivation in India. In Mr. Suresh Chengappa and his farm “Honey Valley” in Karnataka, I finally found him! Thus, in the beginning of February 2014, I set upon the increasingly-tedious way from Mumbai to Mysore via Bangalore and then onwards towards Madikeri (Coorg District Town) and then further on to Kabbinakad. From here onwards, the only way to go any further was by asking the direction as there were no sign posts any more. 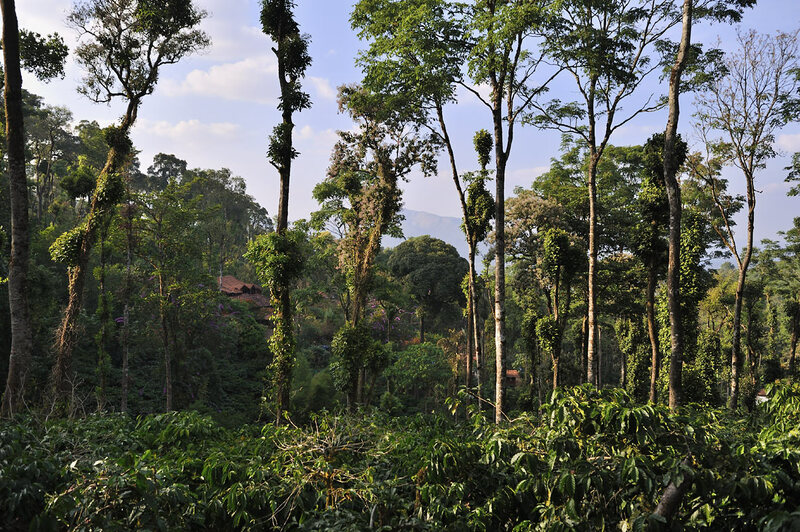 Based 1,300 meters high, the coffee plantation is surrounded by rain forests and besides coffee, it also grows pepper. Both plants are in a symbiotic relationship with one another. 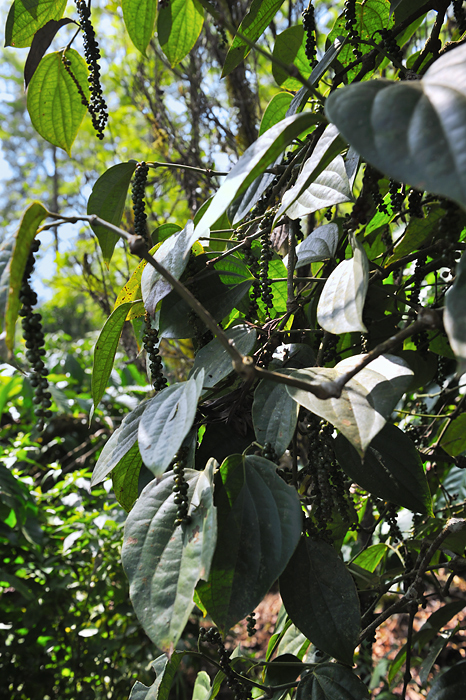 Pepper is a climbing vine, which climbs up the trees that provide shade to the coffee. 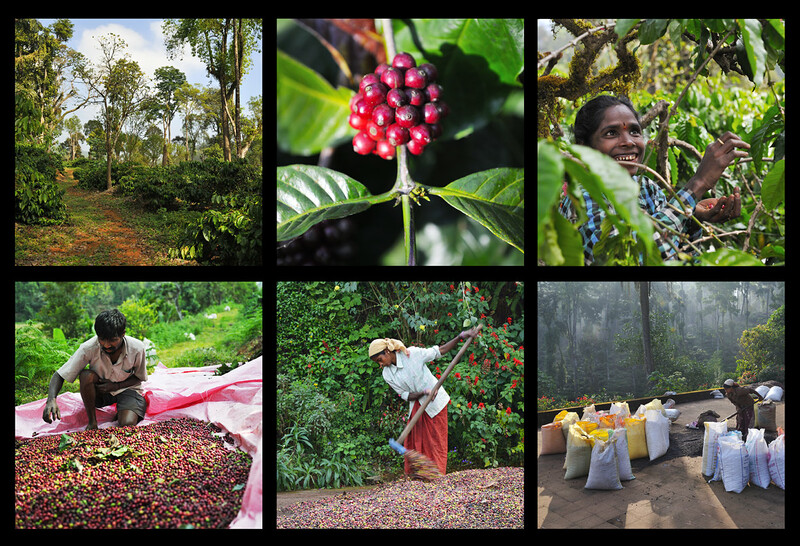 After Brazil, Vietnam, Indonesia and Columbia, India is the fifth largest coffee producer in the world. 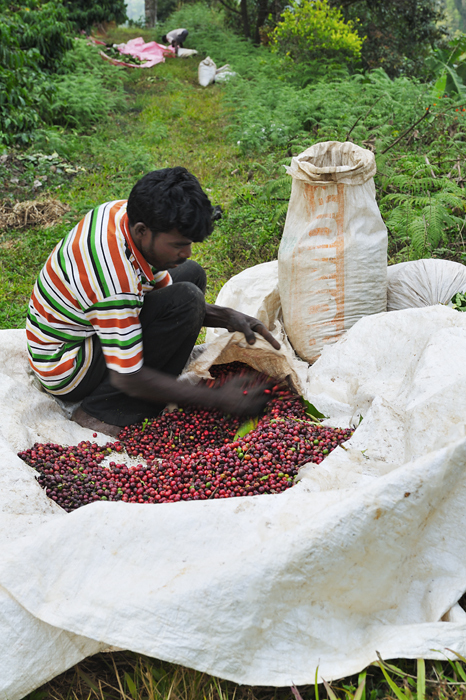 In 2013 India produced over 320,000 tons of coffee, which is roughly 4.5 percent of the world's coffee production. Of this, over 216,000 tons are Robusta coffee and 104,000 tons are Arabica coffee (ratio '67/33'). Coffee in India is traditionally grown in the mountainous regions of the southern states. Over 50 percent of the country's coffee is grown in Karnataka, followed by around 30 percent in Kerala and 10 percent in Tamil Nadu. New coffee-growing areas are located in the states of Andhra Pradesh and Orissa on the east coast of the country as well as in some of the north-eastern states such as Assam, Manipur, Mizoram, etc. Around 80 percent of this coffee is exported largely to Italy (21 percent) and to Germany (13 percent) but also to Russia, Belgium, Spain etc. All coffee species and varieties in India are generally grown in shady conditions and between different spices such as cardamom, cinnamon, cloves and nutmeg. Consequently, they often take on the flavours of these spices on account of the close cultivation and storage. 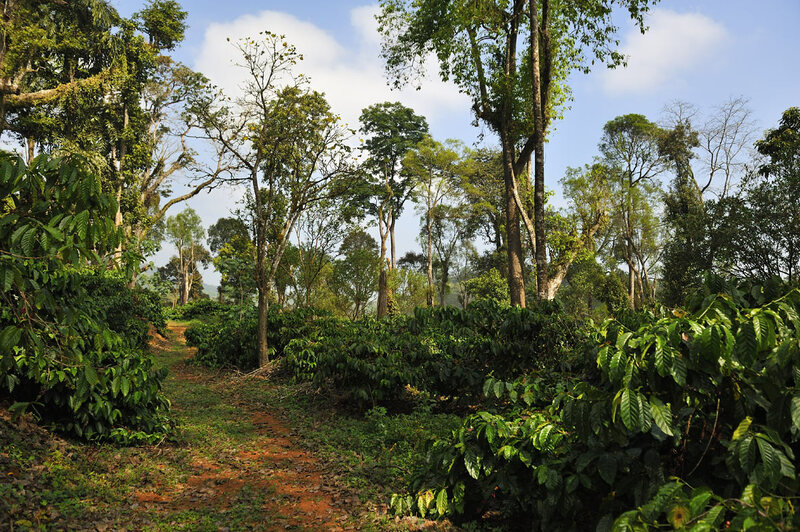 Robusta coffee is cultivated at 500-1000 meters and Arabica at 1000-2000 meters. The ideal climatic conditions for Arabica coffee are temperatures between 23 and 28 degrees Celsius with a rainfall of about 1.5 to 2 m, followed by a dry spell lasting 2 to 3 months. Temperatures near freezing are absolutely unsuitable for coffee. The ideal humidity for Arabica coffee is between 70-80 percent, and for Robusta coffee, it is between 80-90 percent. pepper that has dried up on the plant itself (black). 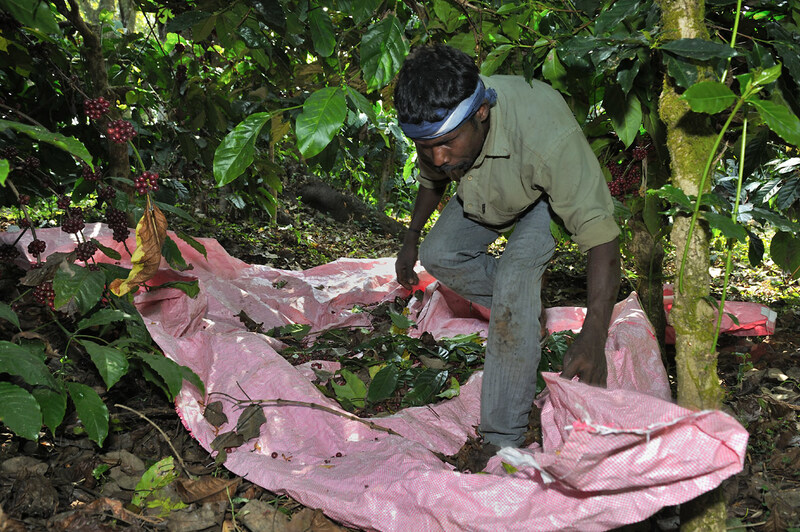 One of the main problems with coffee cultivation in India is low productivity, as a result of which the competitiveness of the coffee is compromised. 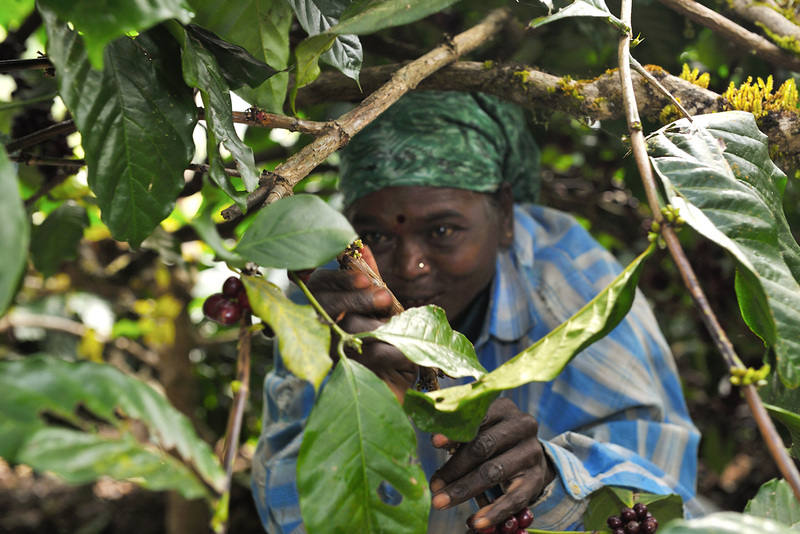 Under the control of the Indian Government, the Coffee Board of India provides small farmers with various subsidies to increase their coffee production and improve the quality of the green coffee. This includes, for example, subsidies for replanting the coffee fields, water conservation and other such measures to improve production quality. According to forecasts of the Indian Coffee Board, after this year's coffee blooming, the production of Arabica coffee in the year 2013-14 will increase by 12 percent compared to last year, and that of Robusta by around 7 percent. 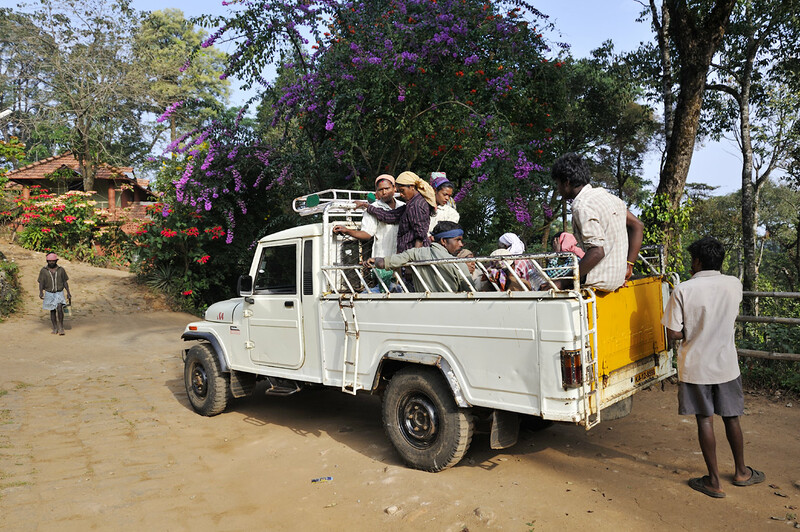 In 2014, the Association of Coffee Farmers of Karnataka hired Brazilian coffee experts for a research project that aims to help address this problem. * The focus of this project is the development of plants that generate higher yields and are more resistant to pests, such as the larvae of the 'European corn borer'. is also the name of the small township. The workers' home in the middle of the farm. school uniforms and one meal a day for school-going children. 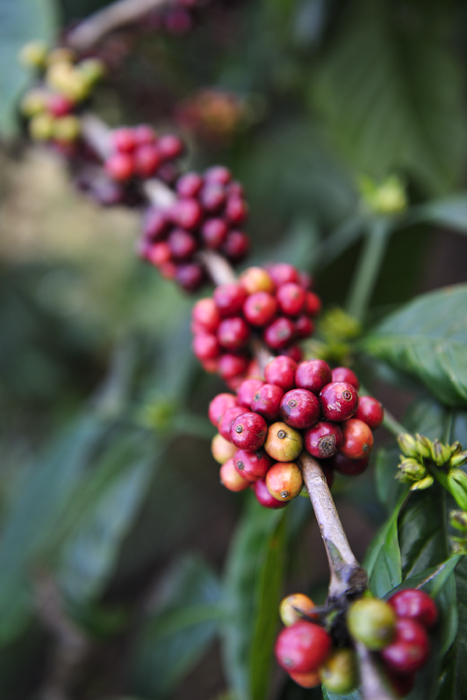 The period between the flowering of the coffee and the ripening of the coffee berries differs for both varieties significantly depending on the climate; Arabica flowers in May and requires about seven months to ripen while Robusta flowers in April and requires about nine months. 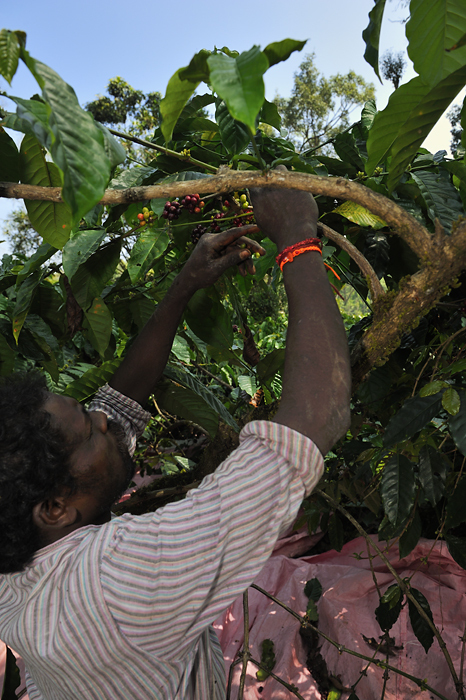 Thus, the harvest of Arabica coffee in Karnataka takes place from November to January, while robusta coffee is harvested from December to February. 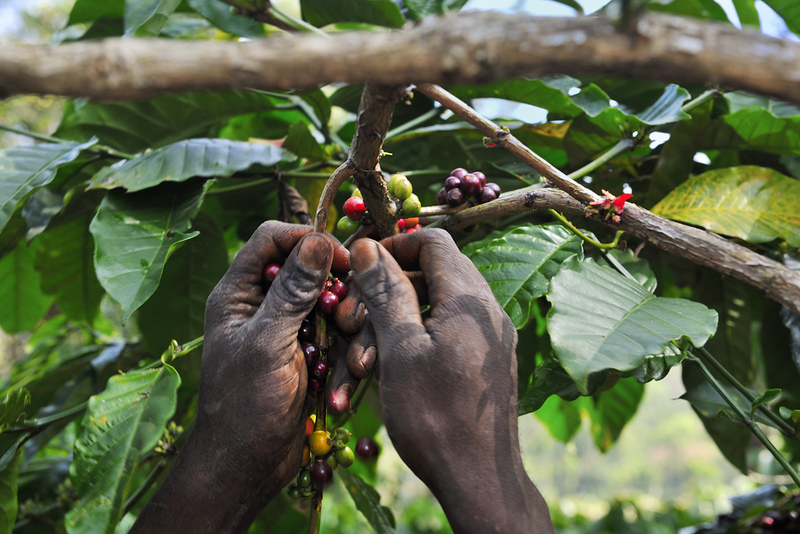 The crop yields, especially of Arabica coffee, are affected due to coffee pests such as the "white stem borer" or the "berry drill" by about a single-digit percentage range. By using pest control, farmers are currently trying to replace the use of chemical substances with environment-friendly organic pesticides. 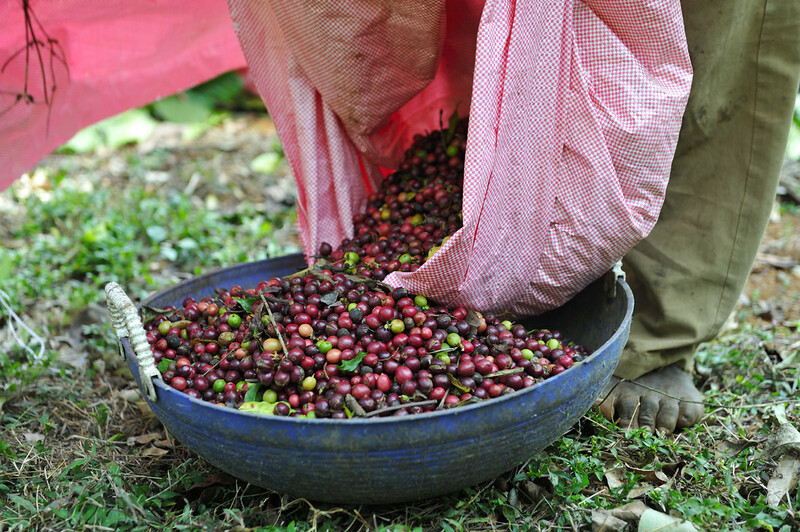 The coffee farmers harvest the crop by hand as always, using the so-called 'stripping method', in which all the cherries are harvested regardless of their degree of ripeness. 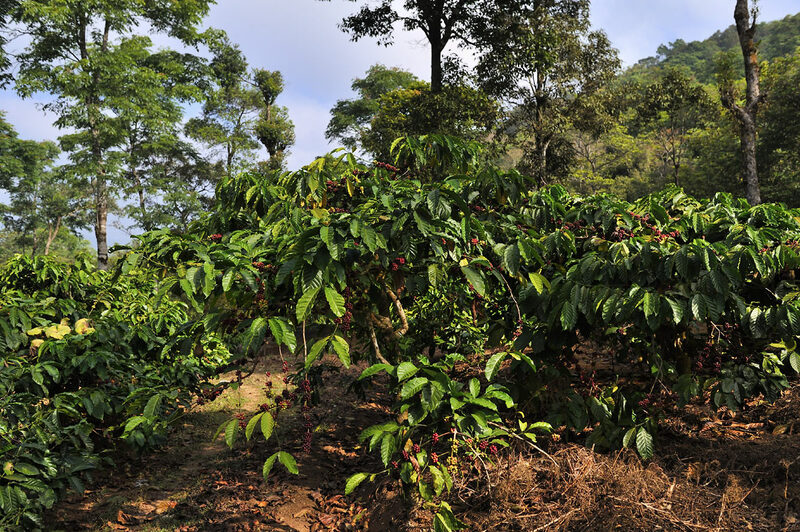 Of course, the coffee farmer waits until the bulk of the coffee cherries ripen, in other words, until they are red, but a certain percentage of the cherries remain unripe - green to yellow - or even dry up on the tree - dark brown to black. The alternative manual harvesting method, the selective method, in which only the ripe cherries are harvested in multiple stages, is simply too time-consuming and labor-intensive, and consequently, too expensive. 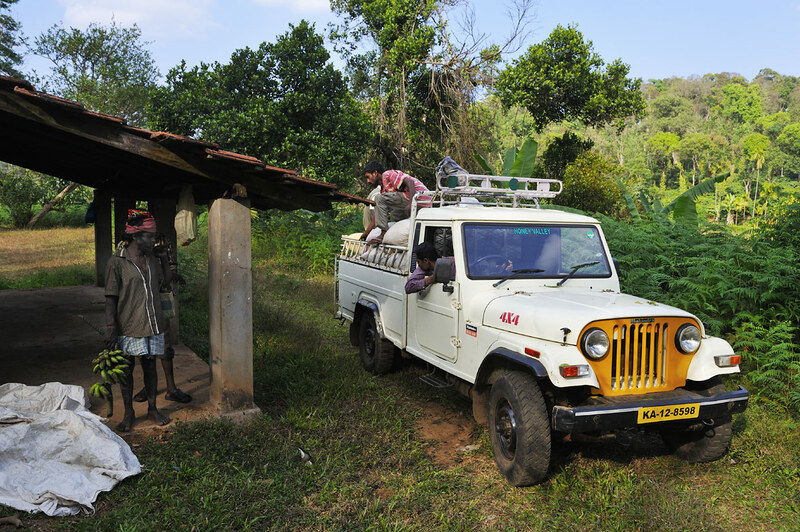 On his farm, Suresh Chengappa grows Arabica as well as Robusta Coffee, approximately in a 50/50 ratio. But in the recent years, he has been growing more Robusta, although the price for Arabica is higher. According to him, the maintenance costs, manpower requirements, crop resistance and crop yield for Robusta coffee make Robusta a better deal, while the additional expenses required for Arabica would not be compensated for by higher sales. At the time of visiting the farm in the beginning of February, Robusta coffee was just being harvested and the harvesting of Arabica was over. 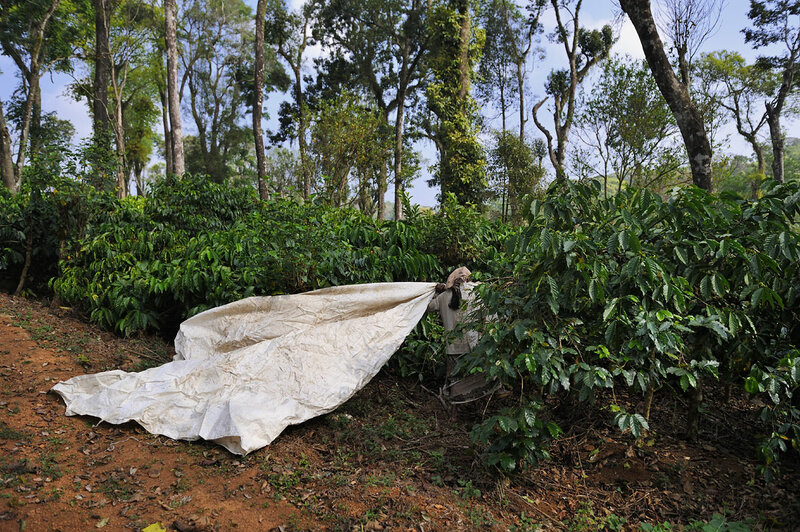 Unlike the harvest of Arabica coffee, the workers do not stand next to the tree, instead they must crawl under the Robusta trees and spread out their tarpaulins to collect 'the stripped' coffee cherries. This process is far more tiring and cumbersome than the one used for harvesting Arabica, but I was nevertheless surprised how quickly 10-11 people manage to harvest a fairly large area in a single day! These are very hardworking people, many of whom are members of tribes from the surrounding area, some even living on the farm itself. During conversations in the evenings, I find out that they party just as hard as they work :-). Speaking of Robusta coffee: Like many coffee drinkers I also have a - cultivated - prejudice against Robusta coffee. This is probably down to the consumption of coffees, which were blended with cheap Robusta coffees before roasting or grinding. While this is done simply to reduce costs, the accompanying loss of quality is clearly discernible to the coffee drinker. There have been drastic responses to this in the past. For instance, the american “Specialty Coffee Association”, categorically stopped the mixing of Robusta-Coffee in their premium coffees! I have myself tasted 100 percent Robusta Coffees and have to say that the flavour is similar to that of old, wet cardboard boxes with a generous shot of well worn-out car tires! Coffee connoisseurs from India claim that this view is the result of the consumption of low quality and cheap robusta coffee, but there also exists very high-quality Robusta coffee with a fine aroma. Keen to be convinced of this, I feel quite excited! The most famous Indian brands are Anamalais, Araku Valley, Bababudangiris, Biligiris, Brahmaputra, Chikmagalur, Coorg, Manjarabad, Nilgiris, Pulneys, Sheveroys, Travancore and Wayanad. The coffees are named after the regions from which they come. There are also a couple of special brands such as Monsoon Malabar AA, Monsoon Nuggets Extra Bold and Robusta Kaapi Royale. The four main botanical varieties of Indian coffee today are 'Kent' (named after the Englishman L.P. Kent), 'S.795', 'Kaveri' and 'Selection 9'. The most commonly grown Arabica variety in India and Southeast Asia is 'S.795' because it combines its balanced aroma with the subtle flavors of mocha coffee. (Here, mocha refers to the Yemeni coffee blend, not the Arab or Austrian method of coffee preparation.) 'Kaveri' also known as 'Catimor', is a cross between 'Caturra', which is frequently grown in Brazil with 'Hybridomas de-Timor', while the award-winning variety 'Selection 9' a cross between 'Tafarikela' and 'Hybridomas de-Timor'. It is also interesting that two of these varieties, namely 'Kent' and 'S.795', go all the way back to the very first varieties brought (more likely, smuggled!) into the Baba Budan Giri hills of Karnataka in the 17th century! See below for more! The "Indian Monsoon Malabar coffee" (Indian Monsooned coffee), an Indian specialty, is produced mainly on the Malabar Coast around Mangalore in the south of India. 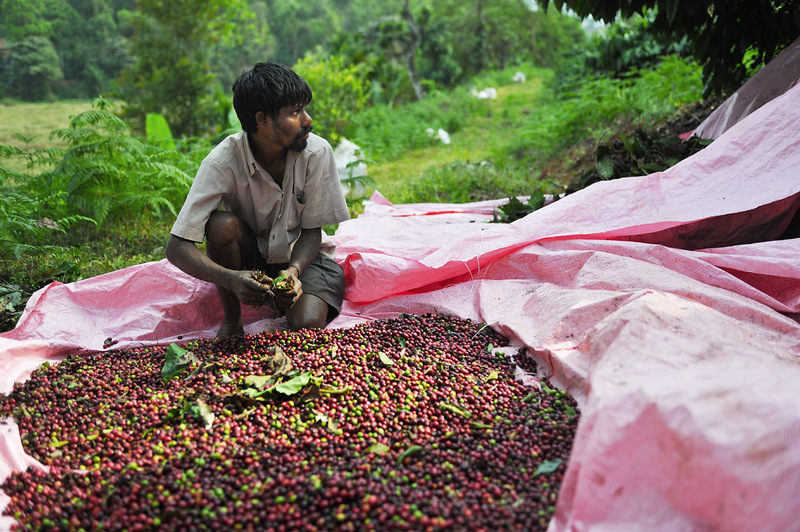 Monsoon-coffee gets its special taste through a unique preparation method called "monsooning" – a process of ripening at high humidity. 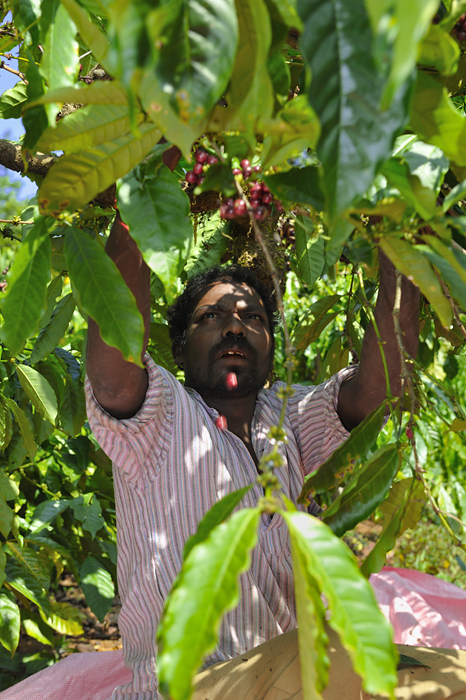 The harvested cherries are exposed to the high humidity of the heavy rains and winds of monsoon for a period of about 3-4 months, causing them to swell and lose their original acid, which in turn leads to a subsequent beverage having a near neutral pH. This coffee is very gentle on the stomach due to its minimal acidic content; the processing method gives it a full body with a velvety-smooth flavour. This coffee is unique to the Malabar coast of Karnataka and Kerala, and its brand is regionally protected, just like Parmesan cheese, for example. The opinions about its flavour range from "absolutely the best Indian coffee" to "well, maybe a little bland." 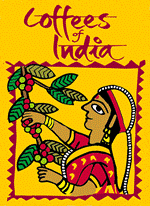 The history of the Indian Monsooned Coffee is quite interesting. For centuries, the Indian coffee was shipped from the Malabar coast in sailing ships headed for Europe, initially mainly toward England. The trip to England took almost 6 months, and the coffee was exposed during the entire duration to the changing, harsh climate, high humidity, salt air, the monsoon rain, the cold at the Cape of Good Hope, then again the heat along the African coast. These conditions allowed the green coffee to swell, which, as described above, changed its properties. With steam navigation and the construction of the Suez Canal, the travel time to England was reduced to just a few weeks and the storage facilities also improved. Suddenly 'regular' coffee began to arrive in England, but by then the coffee drinkers there were accustomed to the former taste of the swollen coffee – and wanted to have it again. Thus began the practice of exposing coffee after harvest to the wind and humidity of the monsoon on the Malabar coast of India for weeks to artificially re-create the previous taste. This method has survived till date and with it, a fair bit of the old coffee tradition, keeping a part of the long history of coffee alive. Of course, coffee farming in general has a much longer history that begins in Ethiopia, and in the 15th century leads to Arabia and from there to Yemen. The coffee cultivation began in India in the 17th century - so it goes - with the Indian Muslim saint Baba Budan, who after his pilgrimage to Mecca in the year 1650, brought seven germinable coffee seeds to Chickmaglur in Karnataka, from where Indian coffee cultivation began to spread. At the time, it was illegal to bring coffee seeds from Arabia but because the number seven is a sacred number in Islam, the smuggling of seeds was classified as a religious crime. The significance of his action must be assessed in light of the fact that the Arabs at that time strictly controlled the export of germinable seeds of coffee. Baba Budan planted his coffee trees in the Chandragiri Hills (1,829 meters high), today named after him "Baba Budan Giri" (giri = hill). After these initial, isolated plantings, the first systematic cultivation by private owners followed in 1670. 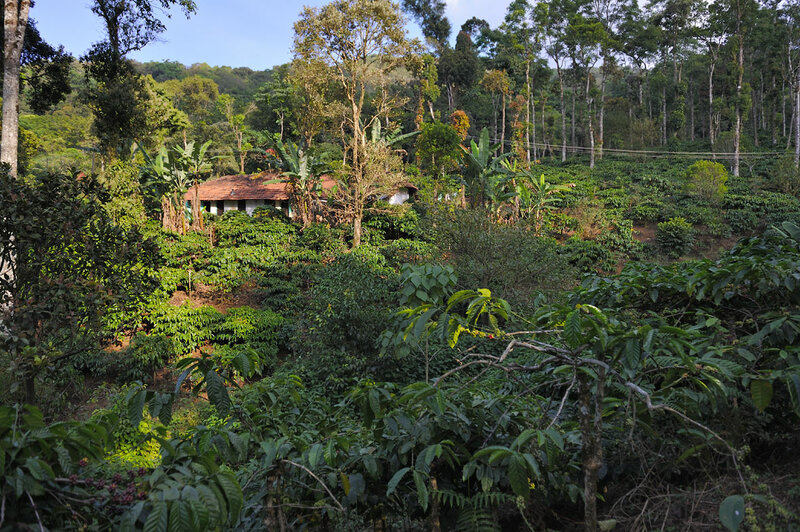 The first "real", larger coffee plantations were set up 1840 onwards at Baba Budan Giri and the surrounding hills of Karnataka. 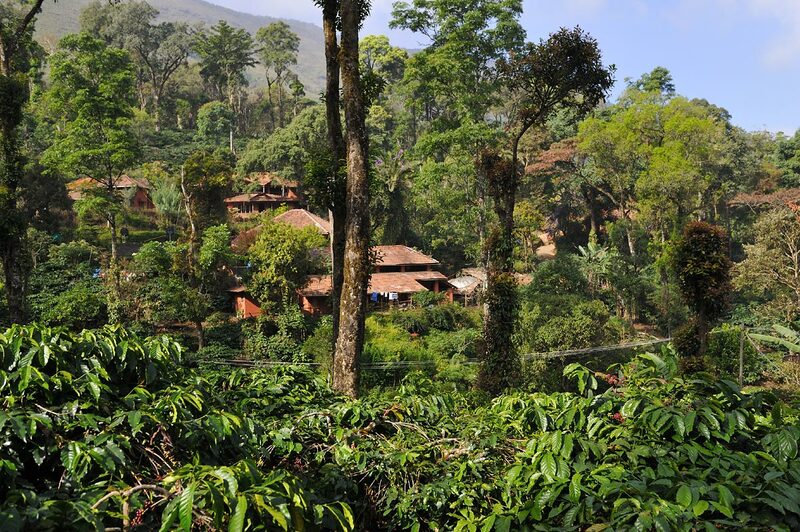 From there, the coffee spread to the surrounding areas around Wynad (today: Wayanad, Kerala), the Shevaroy Hills and the Nilgiri Hills in Tamil Nadu. With the consolidation of the British colonial power in India in the mid-19th century, the cultivation of coffee for export grew steadily. Thus, the coffee culture spread more decisively in South India than in the North, where tea is mainly grown and drunk. 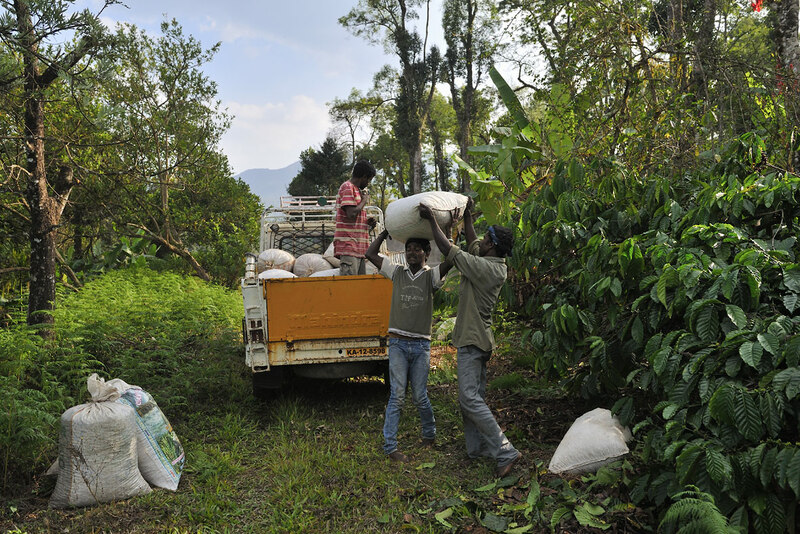 In the initial phase, the plantation of Arabica coffee was very popular. But after a serious infestation of coffee rust, a small species of fungus, a more 'robust' coffee variety was grown as an alternative (subsequently named Robusta-Coffee), alongside a fungus-resistant hybrid, a cross between Liberica coffee* ('Coffea Liberica') and Arabica coffee. * = In comparison to Robusta and Arabica, pure Liberica-coffee has less economic importance. It is grown in Liberia, Sierra Leone, Central African Republic, Benin, Philipine and Indonesia. 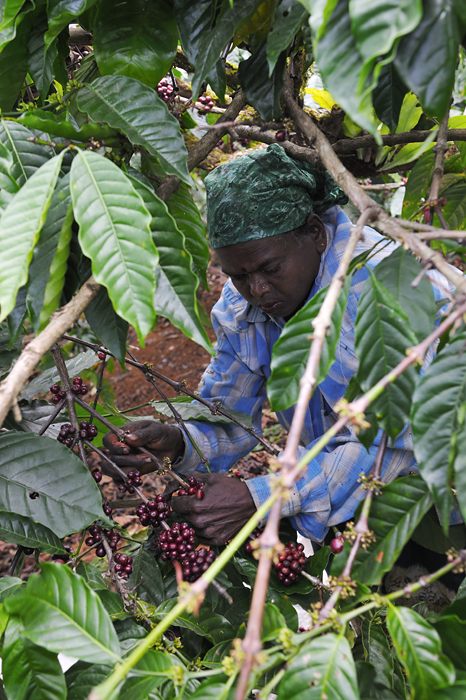 Compared to Arabica or Robusta, Liberia fruits are harder, less juicy and contain less sugar but more caffeine. For this reason, the beans are considered to be comparatively inferior. 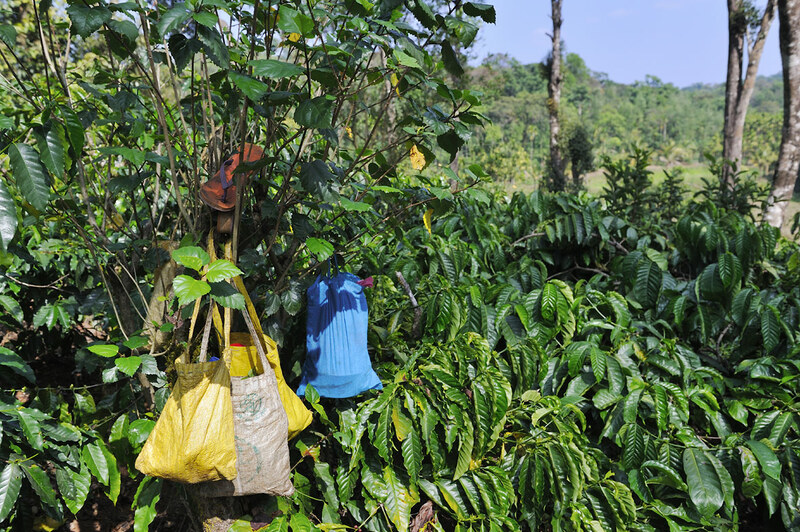 After Excelsa-coffee, Liberica requires the longest ripening process of about 12-14 months. The variety is considered highly resistant to parasites, and in terms of production volume and life expectancy, it is superior to Arabica and Robusta. In the year 1942, the government decided to regulate the export of coffee to protect the small farmers from falling prices. 'Coffee Law – VII' brought into existence the 'Coffee Board of India' which immediately assumed control of the coffee exports, selling and exporting home-grown coffee at fixed prices. As this took place entirely without any quality control, and the prices were very low, the small farmers no longer had any incentive to produce high-quality coffee. It was only post-1991 that the government began to liberalise the coffee market. In 1996, the last hurdle to the free trade of coffee was eliminated. 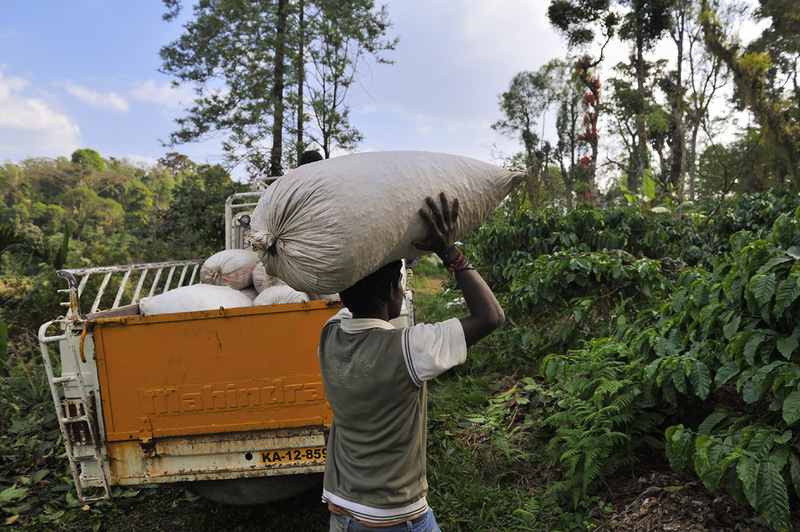 Since then, farmers can sell their coffee wherever they wish.